The answer is yes! Hop on over to Instagram if you’re interested in the photo journey of the pie through airport security and 3 airports! And today, Wendy is the hostess for this month’s Food N Flix pick, A Man Called Ove. Wendy really pushed me out of my comfort zone here. I knew the movie was based off a book by the same name, so I chased down a copy and read that first. I was skeptical, to say the least. The book was described as “heartwarming”. I usually ending up rolling my eyes throughout “heartwarming” books (yikes, maybe I am cold-hearted!) and I’ve recently come to the conclusion that while I’ll tolerate the occasional realistic or contemporary fiction, they are really not my thing (unless there’s a lot of mystery or action). So, I grudgingly started the book and darn it if Ove and the ragtag cast of characters didn’t grow on me! I really enjoyed that heartwarming book! 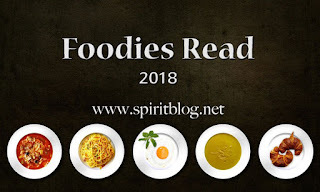 I’m not going to share a synopsis here, because I’m no good at those and I trust that you can click the various links and find out more for yourself, okay? Okay. Then, I got around to the movie. You guys! It’s in subtitles! AHHHH!!! How am I supposed to do homework and watch a movie at the same time when I’m reading subtitles?!?!? Well, I couldn’t, so I was forced to take a break from homework (not the worst thing in the world) and actually watch the movie. The movie stayed fairly true to the book, but as this librarian always says, “the book was better!” So definitely pick up the book if you get the chance! Now to the food. Ummmm…. Soooo, there wasn’t a ton of food in either the book or the movie. However Saffron Rice & Chicken and Meat & Potatoes did make an appearance in both. I’m not completely unfamiliar with saffron. In fact, saffron makes in appearance in my grandma’s Easter bread, which I’ve made but still haven’t blogged (I’ll make that my 2019 goal). But that’s my only saffron experience and Easter bread is a sweet bread! But I decided to give it a whirl anyway. And it was amazing!!! 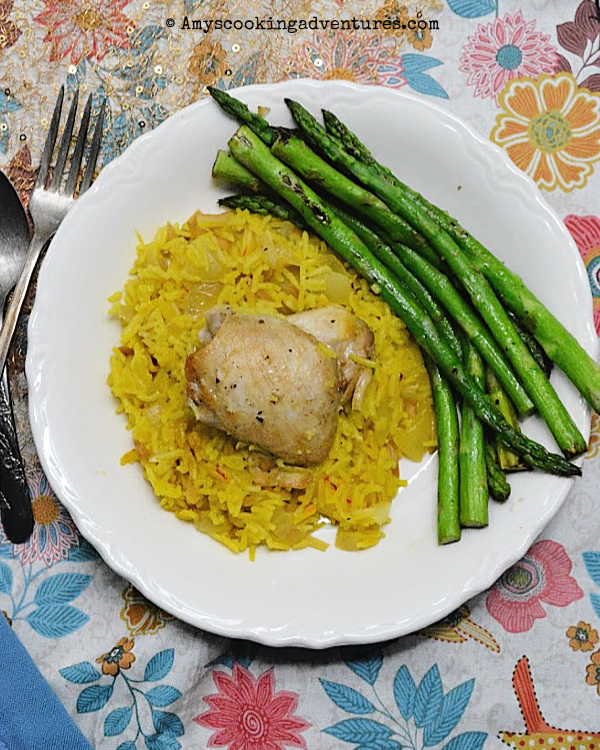 Saffron was the only “unfamiliar” ingredient here, so the family took to the recipe very nicely. 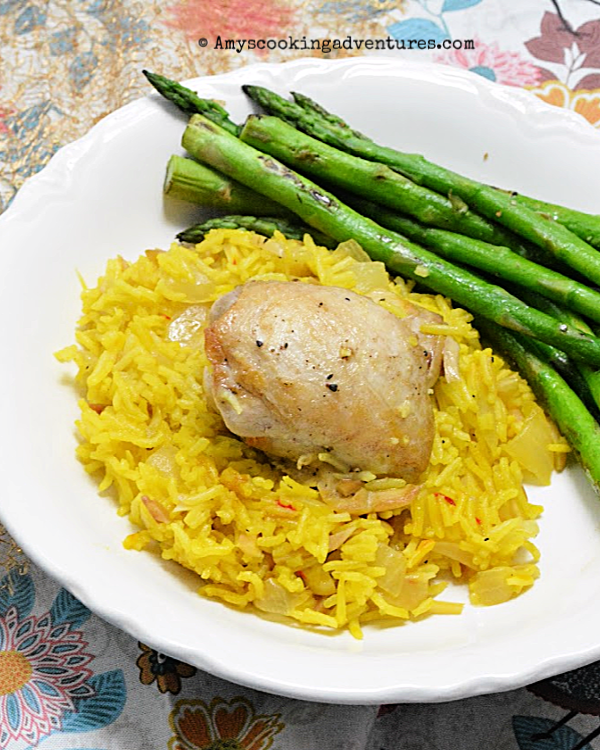 I loved the flavor combination with the saffron, onions, garlic and almonds. I still have a bit of saffron on hand and would definitely consider making this again! Heat 1 tablespoon of oil in a large lidded skillet over medium heat. Add the almonds and fry for 3 minutes, stirring frequently. Once the almonds are browned, set them aside on a paper towel lined plate. Heat another tablespoon of oil in the same skillet over medium heat. Season the chicken with salt and pepper. Cook until browned, then flip and brown the second side (about 6 minutes total), set aside. Heat the remaining tablespoon of oil in the same skillet. Add the onion and cook until softened, about 5 minutes. Add the garlic and rice and cook for another minute. Add the chicken broth and bring to a boil. Stir in the saffron bay leaf, and almonds; season with more salt and pepper. Place the chicken on top of the rice. Cover and simmer for 15-20 minutes or until liquid is absorbed, chicken is cooked through, and rice is tender. If the liquid is absorbed before rice is tender, add additional hot water, ¼ cup at a time until rice is done. I'm glad you enjoyed the book. I agree that books are nearly always better than the movies but I did enjoy this movie and thought the actors were perfect picks. Looks so delicious! I'm glad your family had an open mind. Sounds like you had a wonderful Thanksgiving and hope the traveling pie (and you) did not run into any weather delays. I love you shared your connection with Wendy! That is great---as is this dish of saffron rice. 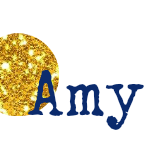 I love that you were pushed out of your comfort zone, Amy. And I'm jealous that you got to spend time with Wendy. Though I've only met her a couple of times in person, I adore her. This looks delicious. Good job! I can't wait to read the book. I did enjoy the movie!